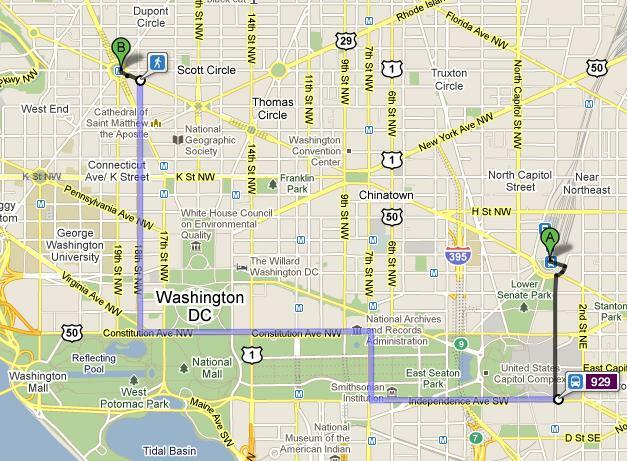 Users of Washington D.C. area public transit will soon be able to map out their routes using Google Transit. Image from Google. Paris selected the electric Bluecar for its Autolib car-sharing program, which is modeled after the French Vélib bicycle-sharing program and is set to launch next autumn. The car from French company Bolloré is battery-powered and can travel about 155 miles between charges. Turkey’s first bullet train will carry out a test run today. Turkey is preparing to launch a line of high-speed trains across the country and plans to open the new rail network to the public in mid-2011. San Francisco is moving closer to the creation of the Bay Area’s own bike share program. The San Francisco Municipal Transportation Agency is showcasing equipment from various bike share operators today and tomorrow. This week marked 10 years of service for the United States’ only current high-speed rail train Acela. With increased ridership over the past five years, Amtrak plans to expand service and introduce faster trains in the future. In a move to give passengers a stronger sense of security while riding Washington D.C.’s Metro, random inspections of bags and packages will immediately be carried out as riders enter stations. No worries for Amtrak passengers. They can now bring unloaded guns on some trains. According to recently released census data, New Yorkers from four of the city’s boroughs have the longest average daily commute in the U.S.
On a recent visit to Toronto, city officials from Tehran note that traffic in Canada’s largest city is just as bad as the Iranian capital’s gridlocked streets. Highway fatalities in the United States have dropped dramatically in the past few years. Why? Campaigns against inattentive driving? Hard economic times? Less reckless behavior? All of the above, according to a new study from the University of Michigan. With high transit ridership and an expanding subway network, Hong Kong’s MTR is the envy of many urban areas. The MTR’s continued financial success is rooted in development-funded transit, reports The Transport Politic. Charlestown, a neighborhood of Boston, Mass., received its first set of bike lanes this fall, but residents on two wheels were surprised to find the lanes scraped off the pavement this week. Boston is not the only city experiencing controversy over bike lanes on city streets. The fight over the expansion of the bike lane network in New York City rages on. London’s mayor has been pushed to produce significant measures to deal with the city’s poor air quality, of which 80 percent is caused by road transport, but has failed to impress those seeking tougher targets with his most recent goals. California regulators have approved the first cap-and-trade setup in the United States to give polluting companies financial incentives to use less fossil fuels and emit fewer greenhouse gases. Hertz, the world’s largest car rental company, dips its toe in the plug-in car market and pledges to purchase 1,000 electric vehicles to be added to the U.S. fleet later this year. MapQuest launched a new website to allow people to make corrections and additions to its U.S. maps. Open.MapQuest.com is an error-reporting tool that enables users to add rich content to MapQuest’s open map data. The Washington Metropolitan Area Transit Authority (WMATA) plans to make the agency’s bus and rail information available to Google Maps by mid-January. Pressure has been put on the agency for years to get transit data for the D.C. area freed up. Nissan delivered the first Leaf and Chevy, the first Volt, in the U.S. this week. The plug-in vehicles had the same destination: San Francisco. Tags: Boston, California, France, Hong Kong, London, New York City, North America, San Francisco, Tehran, TheCityFix Picks, Toronto, Turkey, United States, Washington, D.C.